Steven (Chicagoland, United States) on 4 March 2015 in Landscape & Rural and Portfolio. 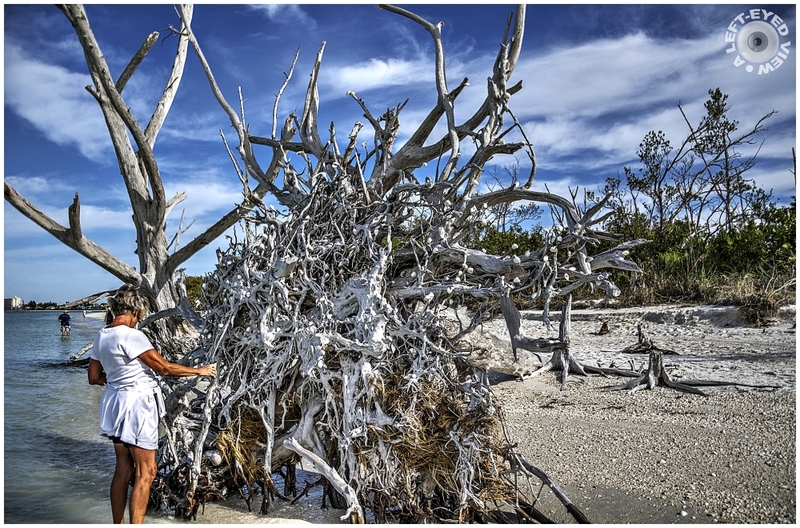 A tree that was upended in Lovers Key, Florida exposes its roots from underneath. Closer inspection revealed hundreds of scallop shells hanging from the roots; most likely hung by people walking by. Photo captured March 20, 2012. A great capture of this once magnificent tree with beautiful color combinations . I've seen these on our beaches here also but not this big... an amazing sculpture and that sky is beautiful! The upended roots make a jumble of tiny parts. It makes an effective image. Very impressive root system and nice eye piece for the beach too! quite a captivating example of "land art" - well seen and taken! The colors and the details make a wonderful image. That is a huge tree! Gorgeous colors. I love how the roots have turned white. It looks beautiful against the blue sky. A fabulous image! Very nice. It is a natural sculpture. A powerful storm to move those stumps. If Nature offers us a chance...why not make it look more like a piece of art! I like it! A great find!